A great lesson I learned from planning my wedding is that traditions are what you make them. In any celebration, we have the choice of which traditional components to accept and which to set aside in favor of more personalized practices. The same applies to Valentine's Day. My husband and I are always open to another excuse to celebrate our relationship but we don't entirely play by the rules. We try to do a staycation and a nice dinner sometime during the month of February because we've found experiences to often be more meaningful than possessions. Instead of giving your partner or galentine flowers this week, consider sharing an experience with them by putting your effort into a beautiful, aromatic, and memorable cocktail. This drink takes inspiration from a timeless bouquet of roses, but I wanted to take the floral element in a different, surprising direction and to break the stereotype of floral drinks being a feminine enjoyment. I knew I wanted to build the drink on a base of gin but chose a more complex option - St. George Dry Rye Gin. I love that this gin is less Juniper forward and offers the rich grain finish of warm spice, similar to a rye whiskey. If you're weary of gins but haven't tried this one yet, it may just change your mind with its smooth yet peppery flavor. I further enhanced that electrifying kick with a 24 hour infusion of black peppercorns. The infusion is quite easy to achieve - simply add gin and cracked peppercorns to a glass jar in the proportions detailed below, then strain with a fine mesh strainer when finished. The peppery spice provided an excellent juxtaposition to the other key ingredient in this cocktail - hibiscus rose syrup. This syrup is made with dried hibiscus flowers and rosebuds (find these on Amazon or at a nicer grocery store) and is both tart and delicately floral. Both the hibiscus flowers and rosebuds also give the syrup, and the resulting cocktail, a stunning deep pink hue. I finished the drink with egg white to smooth out the pepper to a palatable level and added some fresh lemon to enhance the tartness and help develop the egg white foam. To finish the cocktail, you can garnish with either fresh rose petals or the dried rosebuds you used for the syrup. The resulting drink is tart, pleasantly floral with an electrifying touch of peppery spice. To make cocktail, shake all ingredients without ice for about 10 seconds, occasionally releasing the pressure built up in the shaker. Add ice and shake until chilled. Double strain into a coupe glass and garnish with fresh flower petals or dried rosebuds. Enjoy with mood lighting and good company. * For black peppercorn-infused Dry Rye Gin, add 1/2 tbsp freshly cracked black peppercorns and 1 cup of Dry Rye Gin to a glass jar and allow to sit for 24 hours, shaking occasionally. Strain with a fine mesh strainer. *To make hibiscus rose syrup, add 1 tbsp dried hibiscus flowers, 1 heaping tbsp rosebuds and 1/4 cup sugar to a small saucepan with 1 cup water. Bring to a boil and simmer for 15 minutes, then strain and allow to cool. Store excess in the fridge for up to 3 weeks. Thanks to Belen Aquino for the stunning cocktail photography! The creation of this cocktail started with a very wonderful gin-centric adventure. 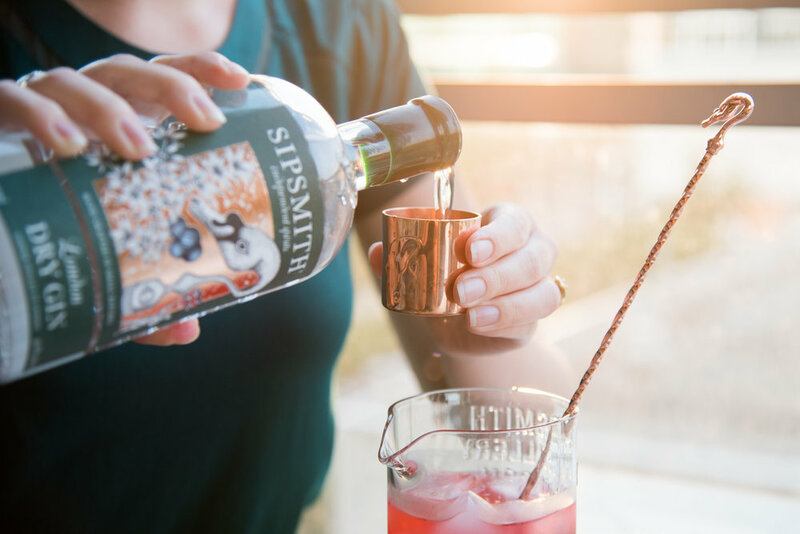 London-based Sipsmith Gin sent me their London Dry Gin along with a beautiful collection of upcycled glass and copper tools adorned with their iconic swan. They then invited me to join them for an unforgettable, cocktail-filled evening at one of Chicago's top rooftop bars, DrumBar. Indisputably, the highlight of the evening was getting to meet Sipsmith Founder and Master Distiller, Jared Brown. Have you ever been able to tell instantly upon entering conversation that your partner is overflowing with knowledge, enthusiasm, and creativity? The opportunity to speak with Jared and hear about his journey in the world of spirits was both humbling and inspirational. 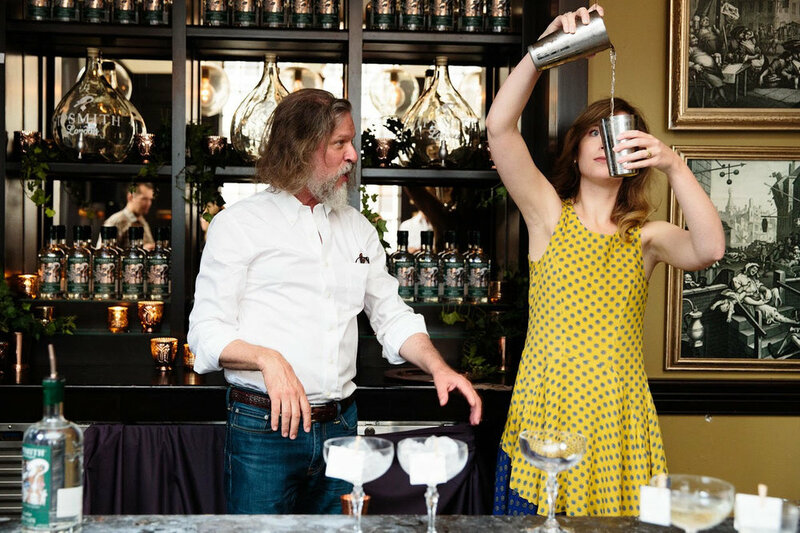 He emerged into the industry spotlight with his website and book celebrating the martini and has since then continued a journey of lifelong learning while graciously sharing his wisdom. I took a chance at royally embarrassing myself when he offered to teach me how to "throw" a martini behind the bar but somehow managed not to spill! Given the art and history behind Sipsmith's London Dry Gin, my gorgeous newly acquired tools, and the passion I felt from their entire team, I knew I wanted to create a truly special cocktail with vintage flair. I started with the idea to use an intricate crystal coupe, lemon cordial, and a fruit and herb component. Lemon cordial makes a great alternative to fresh lemon juice as it's thicker in texture like a limoncello yet preserves the brightness of the citrus. It's an excellent ingredient to take a cocktail from flat to multi-dimensional. 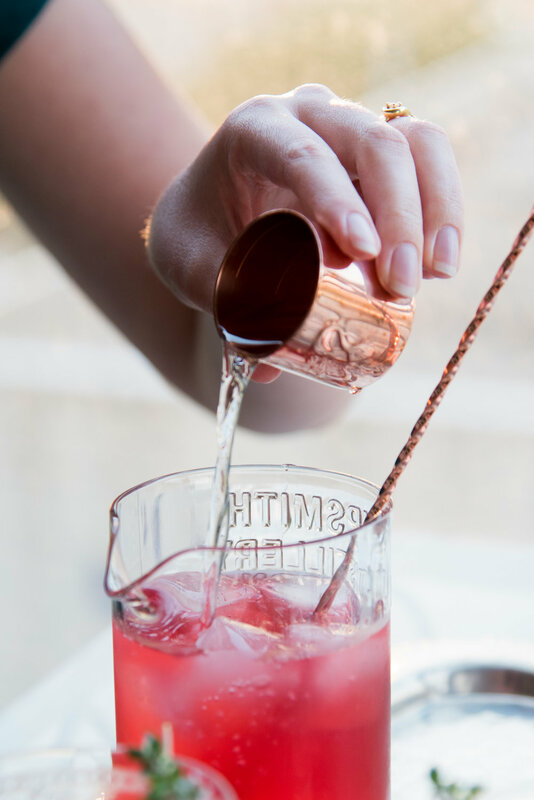 If you whip up a batch for this cocktail and have some left over, give this delicious Rosé punch a try. To enhance the European roots of this cocktail, I decided to feature woodland strawberry tea as the fruit component. You've likely never had woodland strawberries if you're in the U.S. as they're native to Europe, but you can luckily still find them in tea form. Woodland strawberries are smaller, sweeter, and more fragrant than garden strawberries, and the tea luckily captures their vibrant flavor. You can typically find the tea at Eastern European food stores (woodland strawberries are called zemlyanika in Russian and poziomka in Polish). I cold brewed the tea overnight to get a more concentrated flavor and added fresh thyme from my rooftop for the herbal component. The pairing was absolutely delightful and transported me to being in a sunlit forest grove at the height of summer. Use the excess tea mixture to spice up lemonade or simply enjoy it chilled on its own. I've found it best to stir rather than shake drinks with cold-brewed tea to avoid over-dilution. Stirring this cocktail chilled the ingredients while maintaining the potency of the flavors. To finish it off and enhance the sensory experience, I added some flowering fresh thyme garnish. The resulting drink was unbelievably smooth with a light fruity sweetness enhanced by a bouquet of herbal notes. Stir first three ingredients with ice until chilled then strain into a coupe glass. 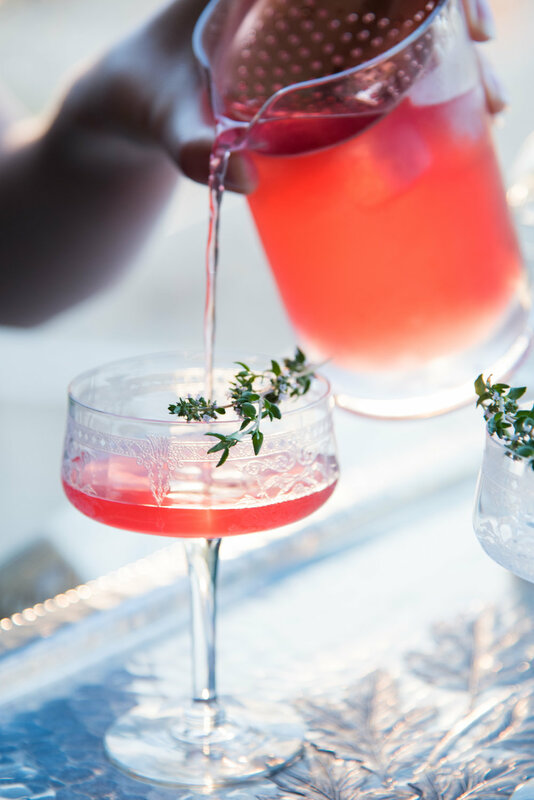 Garnish with a sprig of fresh thyme and enjoy while dreamily watching a spectacular summer sunset. Note that the ingredients for this cocktail are listed in metric units as Sipsmith provided me with a lovely metric measuring tool. If you don't have metric tools on hand, use a ratio of 1.5:3:0.75 fluid oz. * To make cold-brew, add 24 oz of water, 4 teabags of woodland strawberry tea, and a bunch of thyme to a glass jar. Shake to incorporate and leave to infuse overnight. Strain and store excess in the fridge for up to 1 month. ** To make lemon cordial, heat the peel of 3 lemons, 3 cups of water, 2 cups of sugar and 1 tsp citric acid in a saucepan for about 7 minutes. Remove from heat and add the juice of 7 lemons. Allow to cool, then strain. Store excess cordial in a glass container in the fridge. Thanks to Azuree Wiitala for the event action shot, Belen Aquino for the stunning cocktail photography and to Gather Vintage Tablescapes for the beautiful vintage glasses and tray. Lovers of bitter flavors rejoice - this cocktail is the first (and most potent) in a three part series covering my exploration of bitter spirits! Not a fan of bitter cocktails? You're probably best off avoiding this one - but I have some more manageable options coming your way. My goal was to find a spectrum of bitterness that everyone could enjoy so the two recipes to follow this one will be less booze/bitter forward and lighter in flavor profile. I was inspired to create this cocktail after a trip to Fonda Frontera in Wicker Park. They offered a modern take on the classic Vieux Carré cocktail with Añejo tequila replacing the cognac. I loved the smoky, bitter feeling of the drink and wanted to give it a try with the ingredients I had on hand in my home bar. I'm not much of a tequila drinker but I tend to love all forms of aged spirits for the richer, woodier taste they take on through barrel aging. Añejo tequila is aged in small oak barrels from 1 to 3 years and features an amber color and pleasantly smoky flavor and aroma. I recently received a bottle from Grand Centenario, and it's hands down the best tequila I've ever tried in terms of flavor and mouthfeel. I used Koval Distillery Rye but Rittenhouse Bottled-in-Bond Rye could be an alternative if you're looking to limit your costs. For the bitter element, I chose St. George Bruto Americano. I first discovered this delightful spirit when looking for a natural alternative to Campari (which uses red food coloring). I had a lot of faith in the St. George brand for their diverse line of gins and Spiced Pear Liqueur. Their take on an aperitivo liqueur certainly left an impression. The Bruto really packs a punch and can be used sparingly to add citrusy, woody and bitter complexity. I finished the drink off with a few dashes of orange bitters and an orange-peel wrapped Amarena cherry garnish to emphasize the citrus in the Bruto. The resulting cocktail is wonderfully deep in wood and smoke flavors yet surprisingly smooth given that it's 100% alcohol! Stir all ingredients in a mixing glass with ice to chill, then strain into a coupe glass. Garnish with an orange twist, cocktail cherry, or both and enjoy while sharing gripping tales around a campfire. Thanks to Belen Aquino for the stunning cocktail photography and to Gather Vintage Tablescapes for the tray and hollow stemmed coupes.